Let’s talk about how we can find true boredom and how we can avoid it all together. Your child is playing their piece and they don’t seem to be focused at all. In fact, they are looking around, scratching an itch and getting easily distracted. Is this boredom? I would argue that while maybe this looks like boredom there are two main reasons for this kind of distraction. They are easy to tackle and can create much more fulfilling practice. Sometimes we see this sort of distraction when something is actually a little too difficult. It’s time to pull out all the practice techniques to work on that spot and make it easier. The problem with this is that it disguises itself as boredom so it’s easy to assume that maybe it’s actually time to move on to the next thing. Has your child mastered the skill or is it still looking like it needs more work. If it still needs more work, can you do something creative to re-engage them with the skill? It may be time to take that skill out of the piece entirely and work on it a different way. In stead of thinking that it is time to move on to the next thing, talk to your teacher and brainstorm some different ways to approach the difficulty. Often we see what looks like boredom when working on old pieces or review. The child is merely trying to get through and there is very little musicality. This is a sign that we may need to add some interest to those old pieces. There are lots of creative ways to do our review pieces so that they are really getting the focus we need. Review is a great way to have to find enjoyment and a sense of accomplishment with something we know well. It allows us to hone our style, creativity and artistry. If we are only playing the things that are new and difficult, it is hard to really be able to use that creativity. I hope this helps you find ways to think about what looks like boredom and change it up into a more productive practice. Thanks for joining me on this Adventure in Suzuki Parenting and happy practicing! We'll keep you posted via email on tips, videos, classes, and more from Adventures in Suzuki Parenting. 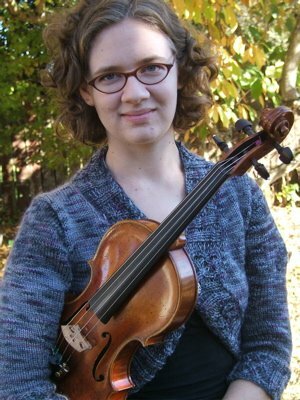 Hi, I’m Jodie St. Clair, Suzuki mom, Suzuki violin teacher, and Suzuki early childhood educator. My husband and I are the parents of a Suzuki boy and a Suzuki girl, and I also am the director of a Suzuki music studio in Eugene, Oregon. We founded Adventures in Suzuki Parenting because we wanted to share awesome resources, training, inspiration, and more with Suzuki parents like you.